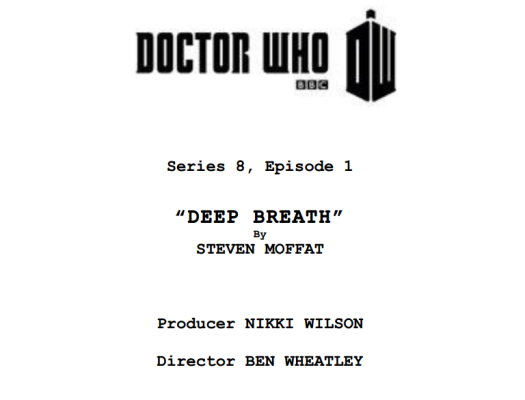 I’ve just finished reading the script from the first episode in the new Doctor Who series. It’s pretty good, actually, apart from a rather large and pointless MacGuffin that initially threatens to derail the plot and a tendency (which, frankly, has been part of the show since the beginning) to rely a bit too much on Deus Ex Machina solutions to tight situations. But the primary plotline is well drawn, and we begin to get an indication of how the new Doctor’s character will develop. The ending is a particularly neat (and intriguing) twist that’s hinted at just enough in the preceding dialogue to make the savvy viewer (or, in my case, reader) grin when it happens. While I appreciate the BBC’s concern, I have to say that, at least in my case, it’s entirely misplaced. I really don’t share the fear of spoilers when it comes to drama. And I think that the hysteria over leaks like this one (and the previous times that it’s happened) are driven by a fundamental misunderstanding of the nature of both visual drama and the people who consume it. Let’s look at that BBC apology in a bit more detail. Why are they apologising to fans? There seems to be an implied belief here that fans of the show a) are incapable of resisting spoilers if they’re available, and b) will have their enjoyment of it damaged by reading them if they do. The first of those is clearly wrong, at least as far as the vast majority of readers are concerned. Everyone who has ever read a book has all the spoilers they need right in their hands. It only takes a moment to flip to the last chapter to see how it all turns out. Most people don’t do that, though. They don’t have to consciously resist the temptation to skip to the end, they just want to enjoy reading the book all the way through. The idea that people are incapable of resisting spoilers is deeply insulting to their inteligence. The fact that the Doctor Who scripts have been leaked isn’t going to make anyone read them who doesn’t want to read them. It’s also not true that knowing how a story unfolds in advance spoils the enjoyment of it. If that were the case, then there would be no point making a movie or TV adaptation of a book, or one based on a well known real life event. But it didn’t hurt the box office takings that everyone knows the Titanic sinks. JK Rowling managed to keep us wondering precisely which side Snape is on throughout the series (at least until the last book, when anyone who wanted to know could just take a peek at the end), but nearly everyone watching the last movie already knew. And even movies and TV series based on original scripts can still be enjoyed the second or third time around, despite having already lost every possible element of surprise. So there are two big falsehoods here: the idea that the fans are incapable of avoiding spoilers, and that their enjoyment of the programme will be damaged as a result. Neither of these stands up to anything more than cursory consideration. We would like to make a plea to anyone who might have any of this material and spoilers associated with it not to share it with a wider audience so that everyone can enjoy the show as it should be seen on 23 August. Apart from the reiterated implication that people won’t enjoy the show if they read the scripts in advance, there’s another little bit of weasel wording there in the phrase “as it should be seen”. Now, I fully accept that it’s up to the show’s makers to decide how it looks when it’s on the screen. That’s what we pay them for; their skill as writers, set-makers, actors, producers and all the other roles that crop up on the end credits. In that sense, I do want to see the show as it should be seen. But it’s a big, and entirely unsupported, leap from there to suggest that “as it should be seen” includes the absence of any knowledge about the content. My reading of the script in advance will not change the show. It will be exactly the same programme for me as it is for everyone else who watches it. So why shouldn’t I read the script before watching the programme? In what way is this different to reading a Harry Potter book before watching the film of the book? Who, precisely, is being harmed by this? I’ll just throw in a couple of side comments here. The first is that reading the script is very different to seeing the programme in advance. There are cases where TV programmes and films have leaked to the Internet – not the script, but the video itself – prior to the release date, and it’s fairly easy to see how that could harm the makers. It may not harm them as much as they think (and this is the “sharing isn’t stealing” argument again, but that’s a different issue that I’m not going to go into here), but the potential for at least some quantifiable harm is obvious. In the BBC’s case, they make a lot of money by selling Doctor Who around the world, and if the show was readily available online prior to the transmission date then some broadcasters may be less inclined to pay for it. But the script doesn’t fall into this category. The other point is that there is a sense in which reading the script in advance is definitely wrong: it involves a clear breach of copyright. But, oddly enough, this isn’t even hinted at in any of the comments either by the BBC as a whole or from Steven Moffat, the writer. Of course, there is the argument that an unpublished script has no commercial value and hence the infringement causes no financial loss. So there would be no point in the BBC trying to sue me, or anyone else with a copy, as it wouldn’t be worth anything in damages (although that argument disregards the possibility that the BBC may want to publish the scripts at some stage in the future, which is by no means implausible). Even so, I do think it’s telling that the BBC doesn’t seem to think that copyright law is a useful angle in this case. Anyway, back to the question. Why shouldn’t I read the script before I watch the programme? It is’t hurting me to read it. It isn’t hurting anybody else if I read it. It isn’t hurting the BBC if I read it. And the one legal reason that the BBC could utilise to prohibit me reading it is not, in fact, being used. There are actually two possible answers to this. The first is that this is just another example of corporate arrogance, of the provider forgetting who is the customer and who, ultimately, pays the provider’s salary. After all, if it isn’t doing any real harm, then why get so worked up about the leak of a few scripts? If people gain enjoyment (as I have) from reading them, then why try to stop them? It’s only an issue in the minds of those small-minded enough to make it an issue, and those small minds don’t control my mind. That’s certainly a plausible hypothesis. It fits in with Steven Moffat’s own comments on previous leaks, where he expresses contempt for people who share them and makes it clear that, as far as he is concerned, a story has no value unless it is secret (so it’s a good job that he works on original drama, then, and not on adaptations). And his belief that “stories depend on shocking people” possibly explains why for me, and, seemingly, quite a lot of people, the revived series went downhill a bit after Moffat took over from Russell T Davies as lead writer. It’s fashionable to blame that on the departure of David Tennant, but it seems to me that the real problem with the Matt Smith era wasn’t Smith, but the material he was given to work with. It will be interesting to see if Peter Capaldi’s Doctor is more three dimensional. And it’s definitely believable that Steven Moffat really is so far up his own posterior that he genuinely feels deeply hurt by the leak of a script. But still, why does it matter? There is, as the saying goes, no such thing as bad publicity. It has to be said that this story has given the new series plenty of publicity. And it’s not like it’s never happened before, either. So maybe, just maybe, someone in the BBC’s publicity department, either with or without the approval of the show’s makers (almost certainly without, if Moffat’s comments are to be taken at face value, or even half face value), has orchestrated the leaks deliberately. If so, I have to hand it to them. There’s nothing like a good dose of viral publicity.